Car accidents and other vehicle related accidents are a common occurrence at the Fort Lauderdale – Hollywood international Airport. Broward County provides a minimum of public transportation options at the Fort Lauderdale airport. As a result, most of the people that are departing or arriving at Fort Lauderdale – Hollywood Airport have to use ground transportation options. But as we all know, when there are vehicles involved accidents will happen. If you were injured in an accident at Fort Lauderdale – Hollywood Airport, then you should contact and consult with a Fort Lauderdale airport car accident lawyer as soon as possible. Whether you’re from Florida or just visiting, there are significant and potentially complex legal issues that can arise if you are injured in any type of car or transportation type accident at the Fort Lauderdale airport. That is where a Fort Lauderdale car accident lawyer can help you. At the Wolfson Law Firm, our car accident attorneys have assisted and represented personal injury victims since 1963 throughout Florida. We have offices in West Palm Beach, Fort Lauderdale and Miami to meet you by appointment. Our Fort Lauderdale personal injury lawyers can also meet you wherever and whenever it is most convenient for you. All you have to do is call us so that we can get started on helping you after your accident at Fort Lauderdale – Hollywood Airport. Call us at our toll-free number (855) 982-2067 and let us help you get the compensation and justice you deserve. There are four terminals at Fort Lauderdale – Hollywood Airport. Terminal one is known as the Yellow terminal and is primarily used by Southwest Airlines, Alaska, Allegiant, Frontier, Silver, United and Virgin America. Terminal two is known as the Red terminal or “Delta” terminal. This terminal is used by Air Canada and Delta. Terminal three is the Purple terminal and is the main terminal for Fort Lauderdale – Hollywood international Airport. This Airport contains a food court at Concourse F. The main terminal is used by JetBlue, Spirit, American Eagle, American, Bahamas Air and several other small regional airlines. Terminal for is called the Green terminal and is used for international travel. The Fort Lauderdale Airport is located just east of I-95; south of I-595; west of Federal Highway (US 1); and North of Griffin Road in unincorporated Broward County. Due to its location, the local governments of Fort Lauderdale and Hollywood have fought for years over the exact name of the airport. 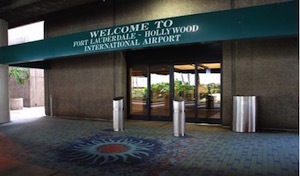 A truce was reached when it was agreed that the formal name of the airport would be known as Fort Lauderdale – Hollywood International Airport. Locally, it is referred to simply as Fort Lauderdale Airport. In 2015, Fort Lauderdale Airport became Ground Zero for a war between Broward County and Uber (and to a lesser degree Lyft) over user fees and regulation. Miami – Dade County and Palm Beach County both sat back and watched the feud between Broward County and the transportation network companies such as Uber and Lyft. Our Uber car accident lawyers closely watched the entire process. Once Broward County sought to enforce regulations against Uber at the airport, Uber ultimately pulled its operations out of Broward County completely. The local government was bombarded by citizen complaints and protests. In the end, Broward County capitulated to the demands of Uber and ended the feud. As part of the settlement, Uber paid Broward County a substantial sum of money representing fees for past drop off and pick up fares by Uber drivers at the Fort Lauderdale international Airport. Since the resolution of the dispute, Uber and Lyft operate without interference at Fort Lauderdale – Hollywood international Airport. However, Uber’s experience in Broward County probably contributed to its push in the Florida state legislature in 2017 for statewide regulation of all transportation network companies. Understandably, Uber and other companies like it would rather operate under one set of statewide rules and regulations then to be subject to the demands in each individual county throughout Florida. In addition to the Uber and Lyft drivers at Fort Lauderdale airport, travelers also have the option of using taxis, shuttles, limousines or rental vehicles. At peak times, the traffic at Fort Lauderdale – Hollywood Airport can be significant. Sometimes there are simply more cars than driving space. Of course, when you have that many vehicles and drivers in a small area accidents can happen. The Fort Lauderdale – Hollywood car accident attorneys at the Wolfson Law Firm are here to help you if you are injured in an accident at the Fort Lauderdale airport. We will aggressively represent you and help you achieve the compensation and justice that you deserve. Our lawyers are not intimidated by major corporations or governmental entities. We do not refer cases out to other law firms for litigation or trial. We will stand by your side until your case is resolved through settlement or jury verdict. Call today for your free and confidential consultation at (855) 982-2067. Injured at an Airbnb Rental in Miami - Who is Responsible?